At the beginning of the Sutra of Golden Light, Buddha Shakyamuni, the Tathagata, the Arhat, the Fully Enlightened, calls to anyone experiencing misery and affliction, bad health, poverty, loss, abuse, ill will, fear, nightmares, or other harms. He says to make the mind virtuous and to come and listen. 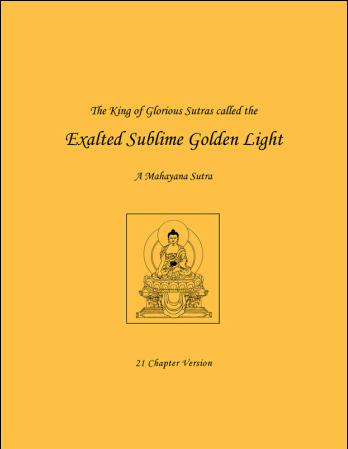 This “King of Glorious Sutras,” contains everything needed, from daily happiness to complete enlightenment. It contains a heart-rending practice of confession and rejoicing, profound teachings on dependent arising, reliable assurances of protection, guidelines for ideal government, and awe-inspiring stories of the Buddha’s previous lives, in which the Buddha shows how, even before he had completely eliminated the delusions, he liberated countless beings from the ocean of suffering through compassion and personal courage. Reciting the Golden Light Sutra is one of Kyabje Zopa Rinpoche's vast visions. Rinpoche says: ‘This text is very precious; it brings peace and happiness and is very powerful to stop violence. By hearing this text, one’s karma gets purified. This text increases success and, especially for leaders like kings or presidents, brings success in guiding in virtue, the path to happiness. In whichever country this is taught, the whole country benefits…everyone is happy and the country becomes harmonious; there are no quarrels. The king gives religious freedom and is always protected by the devas. ​Lama Zopa Rinpoche urges us to recite the Sutra of Golden Light every day. The benefits from reciting, listening to, or even hearing the name of the sutra are immeasurable, from eliminating conflict, terrorism, torture and famine to achieving full enlightenment. Everybody is welcome to attend! Drop by anytime.